The Government has rolled out the red carpet for one of China's top military leaders. The vice-chairman of the powerful Central Military Commission, General Xu Caihou, was one of the highest-ranking officials to visit New Zealand, Defence Minister Phil Goff said. Xu flew into Wellington yesterday for meetings with Goff and Prime Minister Helen Clark after spending the weekend in Christchurch. Xu has recently led efforts to improve military ties with Algeria, Turkey, Belarus and Sudan, as well as Australia and New Zealand. China's military has a patchy human rights record, but experts say efforts are being made to improve that and to rid the ranks of corruption. Xu said he hoped to improve ties between China's People's Liberation Army and the New Zealand Defence Force. Xu Caihou is not just one of China's leading military figures, he is also one of the country's top political leaders. Xu is a member of the Secretariat of the CPC Central Committee, vice Chirman of the Central Military Commission, executive deputy director of the General Political Department of the Chinese People's Liberation Army and concurrently secretary of the Discipline Inspection Committee of the Central Military Commission and deputy Party secretary of the PLA General Political Department. In the '90s he was also director of the Liberation Army Daily (the PLA newspaper). Xu is one of China's top communist ideologues, charged with ensuring the ideological commitment of the Peoples Liberation Army. Xu's current position involves much travel, cementing military ties with countries all over the globe. 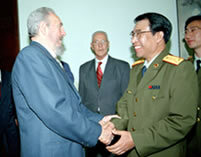 Xu Caihou visited Cuba in April 2004 and in 2005 hosted a visit to Beijing by head od Cuba's military, Raul Castro. Xu Caihou, vice-chairman of China's Central Military Commission, met here Monday with Raul Castro Ruz, Minister of the Revolutionary Armed Forces of Cuba. Xu said China and Cuba had maintained frequent high-level military exchanges for a long period and had conducted effective cooperation in personnel training. Raul Castro's visit would certainly inject "new vigor" to the relationship between the two armed forces, added Xu. Praising China for its stable society and booming economy, Raul Castro, also second secretary of the Communist Party of Cuba, said Cuba hoped to boost cooperation with China in all spheres, and described Cuba's relationship with China as "friendship between comrades". Xu, also a member of the Secretariat of the Central Committee of the Communist Party of China, said China and Cuba, both socialist countries led by the communist parties, had followed socialist paths with characteristics of their own. The two sides, both faced with challenges of developing economy and improving people's living standards, had supported each other in building their countries and armed forces, and would continue to do so in the future, Xu said. Xu Caihou, on his part, said China will make unremitting efforts to consolidate the traditional DPRK-China relationship based on the common understanding reached by leaders of the two countries. I'm sure our leaders were honoured to meet such an esteemed comrade. I hope they weren't so rude as to bring up the three terrible T's, Tianmen Square, Thibet and Taiwan. Not really appropriate in the presence of such a Great Leader of the People. I wonder if they reminisced about the good old days when they all admired the great Chairman Mao?